When we moved into our house here in York, it had been totally renovated by a property developer. Although lovely, it was all very cream. And very - well, bland. The downstairs hallway was covered in large, off white porcelain tiles and the living rooms leading directly from it were wooden floored. I've always been a fan of hard flooring in social areas - it's always a far more practical choice than carpet - but I struggled with the white tiles. Not only were they cold to the feet, particularly in the Winter, but they also showed up every single bit of dirt and dust which made it perfectly clear to all who visited my home that I didn't hoover very often. It just didn't really work for us. When I started revamping my hallway, I was really keen to replace them. One of the things that the white tiles didn't add was warmth of texture. The adjoining dark wood floors were much cosier, much more welcoming than the white flooring and I wanted my hallway to feel the same way. I was intending to paint the walls white so wanted a dark contrast. As a family of five, the hall needed to withstand a fair amount of wear and tear. My son's both play football and regularly bowl through the door with muddy shoes and all three of my children are prone to bag chucking as they enter the house. Any new flooring needed to be durable and able to withstand heavy use by a young family. Therefore, I was keen to work with a brand who had 100% confidence in their product, with a strong reputation for quality and customer service. This is where Amtico stepped in. The perfect contrast with the current floor in the adjoining room. Designed and made in Britain since 1964, the specialist factory is based in Coventry where they create luxury vinyl flooring which is high quality and unique. There are simply hundreds of designs from which to pick in wood, stone and abstract patterns. There's also 92 colours to choose from. There was already wooden flooring in the two adjoining rooms so the huge choice meant that I was able to match it as closely as possible with what I already had. You can also add stripping or a border to your design - again, there's loads of choice. It's super clever, practical and durable and the options are endless. Even better, you can go online and try out their Room Visualiser which enables you to experiment with patterns and colours in virtual room sets. How clever is that? You can choose a simple laying pattern or you can go for a Designers Choice - plenty of choice ranging from Herringbone Plank to Pleat, through to Basket Weave, Woven or Key Stone. Here's the laying pattern possibilities - I chose Random Plank due to my hall size and space. There are four main types of product, covering wood, stone and abstract designs. Design led flooring where you can choose your laying pattern and there are loads of choices. You can finish your scheme by adding a decorative edging or border for impact. This product has a lifetime warranty - even if you sell your home, it transfers to the subsequent owners. Textured and hand crafted in wood or contemporary stone designs. It's warm and practical and the thicker wear layer allows for an authentic and textured appearance. A selection of wood, stone and abstract where you can choose the colour, shape and laying pattern. It's water resistant, easy to clean and suitable for underfloor heating. This product has a full 25 year warranty which gives you complete peace of mind when making a new purchase decision. I visited my local Amtico retailer and collected a selection of samples. I found the one that matched closest to my adjoining floors - Classic Walnut from the Amtico Signature range. But how to lay it? My hallway lies in an L shape so it seemed most sensible to go for a standard straight plank, although I was very tempted by the huge amount of choices available, particularly the Herringbone. However, I decided the straight plank style would suit my hallway the best. It arrived quickly, the Amtico fitter was swiftly booked in and installation was assessed. Brilliantly, the floor was able to be laid direct on to the tile. The experienced fitter laid a quick drying screed that took only two hours to dry, then laid the planks in the pattern in which they would be sealed. When he had fitted them all into place, he then installed them permanently with adhesive. My hallway was transformed. From a cleaning point of view, it's a revelation. It can simply be swept and occasionally mopped which works really well when you are a family with three children. It's much warmer to walk on and because it's a natural textured look, it blends beautifully with the white walls. It also ties up the flooring colour between the rooms as the selection of styles was so extensive I was able to find one that fitted to perfection. It's quite simply transformed my hall from what was a fairly bland and open area into a far more cohesive, warm space and I'm really pleased. Now the only thing left to do is to train my children to be a little less messy! 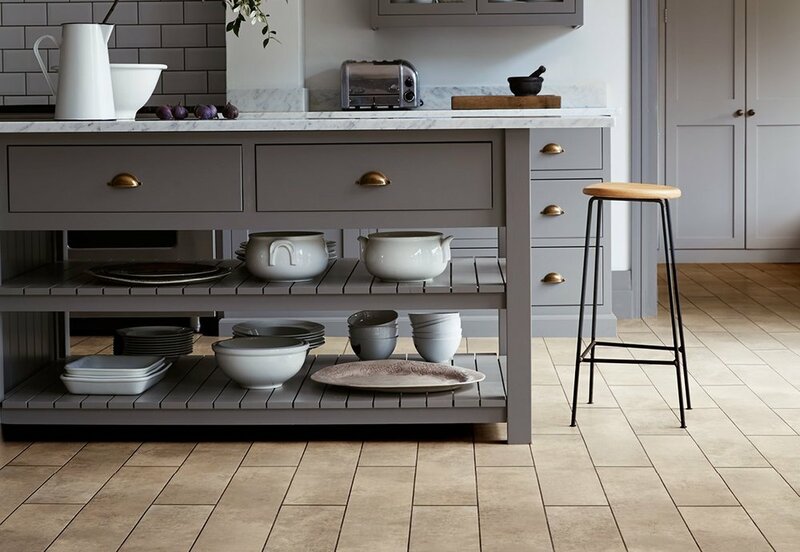 This sponsored post was in conjunction with the lovely people at Amtico. I would never consider promoting a brand that I didn't love and wouldn't use myself.